Have you been hearing a buzzing or grinding noise coming from your computer lately? Does your computer freeze up once or twice a day? 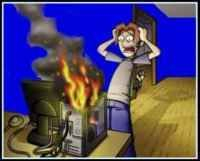 These could be signs that your hard drive is about to crash, your computer's memory is overwhelmed or your cpu could be overheating. These are common problems that can be prevented with proper maintenance from a good computer repair person. At Lake Computer Repair, we analyze these problems and get your computer back to peak performance ASAP! "Lake Computer Repair" & "Lake of the Ozarks Web Site Design" is located at 516 Longacres Dr.
Sunrise Beach, Mo. 65079, just off of Lake Road 5-29 at the South edge of Laurie, Mo. We service the entire Lake of the Ozarks area, including the cities of Laurie, Sunrise Beach, Camdenton, Osage Beach, Greenview, Versailles, Gravois Mills, Linn Creek, Lake Ozark, Rocky Mount, Eldon, Barnett , Climax Springs & the Greater Kansas City Area. E-Mail jclifford01@charter.net at the first sign of trouble. Here are some of the Computer Repairs & Services we can do for you.